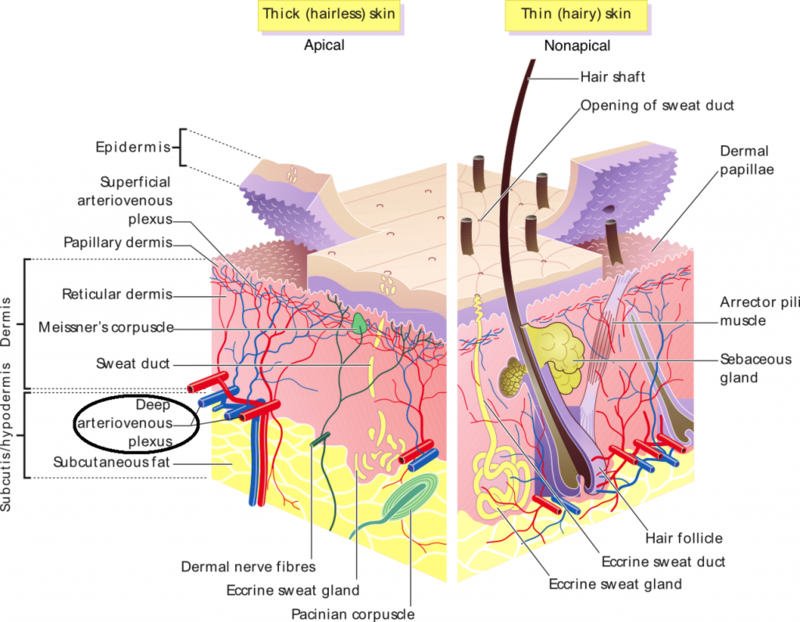 The cutaneous circulation is the circulation and blood supply of the skin. The skin is not a very metabolically active tissue and has relatively small energy requirements, so its blood supply is different to that of other tissues. Some of the circulating blood volume in the skin will flow through will flow through arteriovenous anastomoses (AVAs) instead of capillaries. AVAs serve a role in temperature regulation. In this article we shall consider the different adaptations of the cutaneous circulation, and its role in body temperature control. AVAs are low-resistance connections between the small arteries and small veins that supply and drain the skin. These allow the shunt of blood directly into the venous plexus of the skin, without it passing through capillaries. Since AVAs contain no capillary section, they are not involved in transport of nutrients to/from the tissues, but instead play a major role in temperature regulation. The skin is the body’s main heat dissipating surface: the amount of blood flow to the skin determines the degree of heat loss and therefore the core body temperature. The blood flow through AVAs is heavily influenced by the sympathetic nervous system. At rest, the sympathetic nervous system dominates and acts to constrict AVAs. Sympathetic innervation is decreased, reducing the vasomotor tone in the AVAs. More blood flows through the AVAs and reaches the venous plexus (close to the surface of the skin), increasing heat loss to reduce core temperature. Sympathetic innervation is increased, increasing the vasomotor tone in the AVAs. Which of these statements is not true regarding arterio-venous anastomoses (AVAs)? At rest, these arterio-venous anastomoses (AVAs) are constricted. Which system acts to do this? Which of these regions does not have apical skin?